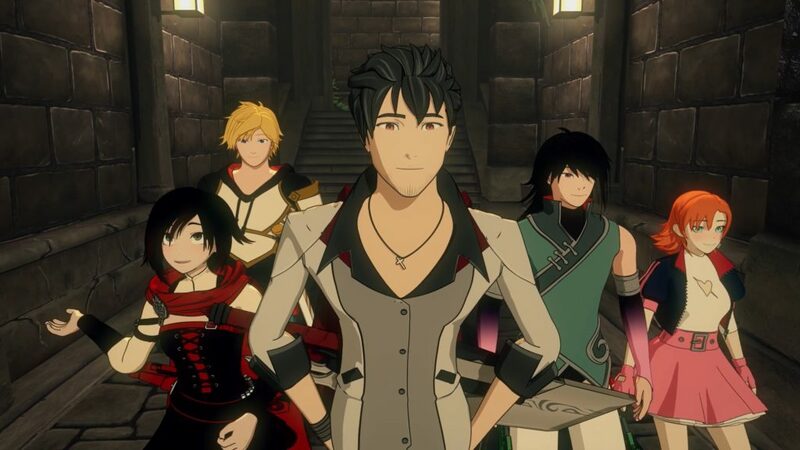 Dylan Hysen, Delaney Stovall, and Andy Potter discuss the Volume 5 premiere of RWBY, “Welcome to Haven”! Well I just the latest episode of RWBY Chibi, so Neo was kind of on my mind. Hi folks. Welcome back. Looking forward to another season of alternating between “Yeah, good point” and “Are you freakin’ nuts?” as I listen to your podcast. 🙂 A couple of quick notes on this episode. You mention being upset with all of the team ending up with “male chaperones” last season, but I have to disagree here. I got the impression that there was an intentional stylistic symmetry whereby they all ended up with their fathers or father figures. Weiss went home to Jacques, her father / arch-nemesis. Blake went home and had a bonding moment with her father. Yang worked out with Tai-Yang. And RWBY spent most of the season interacting with Qrow, technically her uncle, but clearly her father figure. As I watched the character shorts for this season, it seems like we will now be focusing on sisters or best friends. We got three flashbacks showing the major characters with the most important women in their life that are close to their own age. Weiss was shown training with Winter. Blake was shown have a heart-to-heart with Ilia. Yang remembered an important day with Ruby. So, this is our sister season. Based on the team’s love for symmetry, I would say that next season is the mother season. I would expect more Raven next season. I would also hope to see a full understanding of why Weiss’s mother, who by birth should be the matriarch of the family, is wasting away drinking in the garden. And there’s definitely still the mystery of what happened to Summer Rose. The only mother who doesn’t already have a strong story at this point seems to be Kali, but I bet there’s more to her than meets the eye. My other point is more minor. The impression that I got when Yang hammered the lech was that it was her metal arm that let her hit so hard. His bouncing around was either simply a comedic effect, or perhaps his semblance is being Bouncing Boy from DC Comics. Looking forward to next week! Hey Jon, glad to see you back for V5 with us! The fathers sisters mothers thing is a super interesting perspective, don’t think the father theme negates the male chaperones point, like both can be true, but yeah interesting analysis regardless.